When was the last time you were eager to give a great big smile? If being self-conscious about the appearance of misaligned teeth makes you hesitant to grin, it's time to discover the benefits of Invisalign® -- an orthodontic treatment that serves as an alternative to metal braces. Shiloh Invisalign® treatment has helped many people in the area, and even nearby in O'Fallon, get smiles of which they can be proud. The system of clear aligner trays can have you grinning proudly in less time than you might think. If your teeth are crowded or crooked, more than just the appearance of your smile can suffer. Misaligned teeth can make it difficult to brush and floss properly and put you at an increased risk for tooth decay and gum disease. A bite that does not fit properly can also put strain on your jaws and make it difficult to chew, which over time, can lead to uneven wear and tear on your teeth. Orthodontic treatment can correct misalignments of the teeth and jaws and decrease your risk of oral health complications in the future. 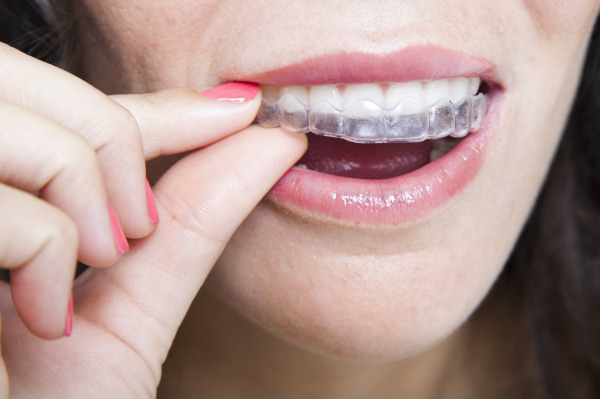 Treatment with Invisalign® involves a set of invisible thermopolastic trays that are worn over the teeth. When in place, they apply pressure to the teeth and jaws and gradually cause them to shift. As your teeth move, you'll be given new trays to wear, so that you can continue to benefit from the gentle pressure. Many patients are completely finished with the trays within 12 months and have gorgeous smiles to show for it. Dr. Shelton is a Shiloh and Glen Carbon Invisalign® dentist who has the necessary experience with this innovative procedure to help you achieve your ideal smile. How Do I Choose an Invisalign® Dentist in O'Fallon or Edwardsville? When you are comparing dentists that offer Invisalign treatment in Shiloh or Glen Carbon, look for one who is a Certified Invisalign® Provider. Only dentists who carry this certification have received advanced training from Invisalign on how to size and care for the trays. Also, be sure to find a dentist that uses the latest technology for fitting. At Park Place Dental Group, we make use of digital imaging technology and three-dimensional molds to ensure a precise fit for your alignment trays. Would Invisalign® Work for Me? Invisalign can be used to correct many different types of misalignments, including crooked teeth, crowded teeth, gapped teeth, overbites and underbites. The best way to determine if Invisalign would be beneficial for you is to schedule an appointment with Dr. Kevin Shelton at Park Place Dental Group. Dr. Shelton is a Certified Invisalign Provider who has been offering this alternative to metal braces to patients in the Edwardsville and O'Fallon area. Call our office today to schedule your Invisalign® appointment.